As part of our process, we are measuring drive temperatures in our enclosure. We wanted to give a standard test platform and location so we can see if there are benefits to power saving features and casing design. Overall the 10TB WD100EMAZ White Label drive runs about 5C warmer than the middle of the pack when running benchmarks, but the minimum is within 1C of what we are seeing with most drives, including the WD 10TB Red drive. 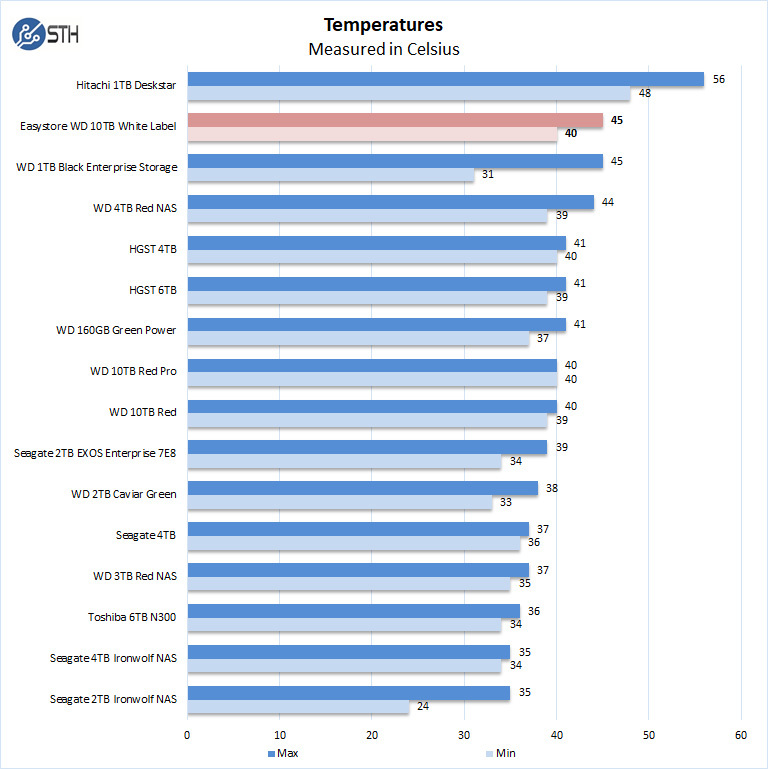 The difference between idle and Max temperatures is a 5C difference which is more than we are seeing from most modern helium-filled drives. There is clearly some firmware difference driving this delta between the Easystore drive and a standard WD Red 10TB hard drive. 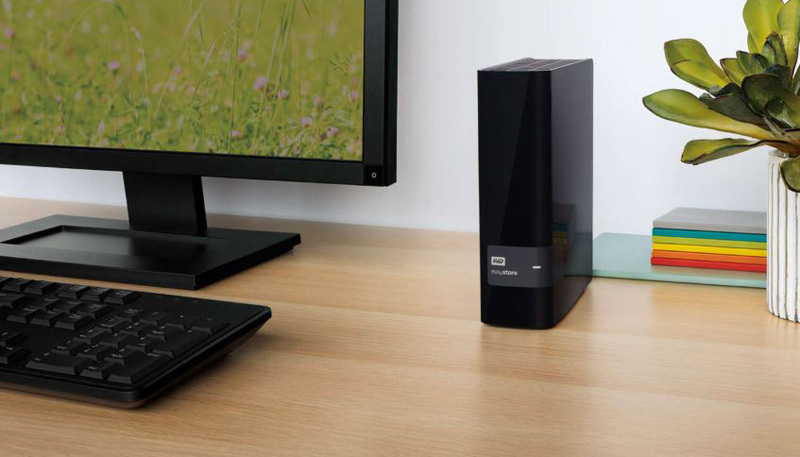 Taking a close look at the WD Easystore 10TB USB Desktop Backup and Storage device has been an interesting test. At the time we did not have an HDD database to use to compare drives, we grabbed up many HDD’s we had and starting benching sixteen different HDD’s. While doing these benchmarks, we saw in our forums many posters finding WD 10TB Red drives inside and others finding these White Label HDDs. I know Patrick, for example, picked up a few dozen for the lab and they were all WD100EMAZ models. A burning question is whether the WD100EMAZ (Easystore white label) is the same as the WD100EFAX (WD Red.) What we determined is they are not exact matches, but performance is reasonably close to each other. WD touts a number of features for their Red lineup making them more suitable for NAS applications. From a hardware perspective, they look almost identical, but there seem to be at least some firmware differences between the two models. We ran into the 3.3V Pin issue with the power supply on our test bench, but not with the Synology NAS boxes we have, nor many servers we use. The bonus for this kit is the easystore 32GB USB 3.0 drive which makes these deals hard to pass up on the Best Buy versions. One ends up comparing a $300+ WD Red 10TB drive to a $180 or so external drive bundled with a 32GB USB stick. One has to weigh whether the slightly better performance, slightly lower temperatures, ease of installation, and warranty make up for the cost advantages shucking a drive offers. If the difference was smaller, we would say not, but this can be seen as an 80% price premium. For those users with a $305 budget, and who are buying a single drive, we think that the WD Red 10TB is clearly the option to buy. If you cannot afford to lose a $180 external drive that fails then this option is frankly not for you. If on the other hand, you have $1220 and are choosing between 4x $305 WD Red 10TB drives ($1220) or 4x $180 ($720) WD Easystore externals and shucking, one can make a valid business decision to forgo the numerous benefits of the WD Red series and self-warranty buying two extra external drives in case of failure. Either way, the WD100EMAZ white label drives perform very well and the deals we find on these Easystore kits to be very compelling and worth getting. Many of STH readers have purchased large numbers of these kits when they go on sale at Best Buy, and they are happy with them.